Sure their cuisine is tasty, and their language is incredibly pleasant to the ears (that may just be to me, but oh well), but deity wise what does Italy have to offer us? They have a feisty mystical meatball of healing magic named Angitia! I promise, that’s the only Italian food thing I will use! Angitia is an ancient healing and snake goddess who was particularly revered by the Marsi. They were in central Italy during pre-Roman times. Throughout the years Angitia became associated with many goddesses from different cultures, but it was the worship of the original Angitia that was the root of the Marsi’s faith. And there was a lot to love about her! Yes, Angitia is associated with healing and snakes, and obviously was unsurpassed when it came to curing people from snakebites. It is also said that she could kill snakes with but a word from her deific lips. Maybe it is because Angitia was already attributed with remarkable knowledge of healing herbs and magics that she is also associated with powerful witchcrafts. This is not to be confused with the religion of Wicca, although Wiccans of a goddess oriented leaning may chose to include such a powerful yet compassionate goddess in their worship. An exhibit at the Chieti’s Civitella Museum has begun that is helping highlight the importance of the goddess Angitia, not only years ago, but today. 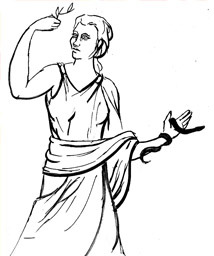 The worshippers of Angitia have provided researchers information as to the dialect spoken in that era, thanks to the various inscriptions dedicated to her. The muesum hopes to highlight links between the natural world and female power. Proving that Angitia’s place is not confined to the ancient world, but in the consciousness of today’s spiritual seekers as well. I promised no more references to Italian food, so I have to admit to having difficulties finding an appropriate or entertaining conclusion to this piece. So here’s what you’re getting. I proudly introduce you to Angitia, an ancient goddess who, thanks to the faith of her worshippers of the past, is finding her way into the hearts of the people of the future.